The following are the latest results contributed by HM Courts Service, for cases sentenced by West Sussex Magistrates’ Court sitting at Worthing from November 8 to 23, 2017. James Phillips, 23, of West End Way, Lancing, was given a community order and must carry out 120 hours’ unpaid work after being found guilty of possessing pepper spray without authority in Lancing on May 4, 2017. He must pay £85 victim surcharge, £500 costs. Anwar Ali, 36, of Corbyn Crescent, Shoreham, was fined £120 and must pay £30 victim surcharge, £85 costs, after admitting drug-driving (6.6ug/l Delta-9-THC) in Southwick Square, Southwick, on July 9, 2017. He was disqualified from driving for 12 months. Aaron Emerson, 47, of Overmead, Shoreham, was fined £120 and must pay £30 victim surcharge, £85 costs, after admitting drink-driving (67mg of alcohol in 100ml of breath) in Eastern Avenue, Shoreham, on October 26, 2017. He was disqualified from driving for 18 months. Mahfouz Khayer, 24, of Victoria Court, Clifton Road, Worthing, was fined £80 after admitting possessing 56g of cannabis in Worthing on May 17, 2015. He was fined £120 and must pay £30 victim surcharge, £85 costs, after admitting drug-driving (26mg methamphetamine) in Victoria Road, Worthing, on May 17, 2015. He was disqualified from driving for 12 months. Ann Mapley, 59, of Cambourne Court, Shelley Road, Worthing, was discharged conditionally for 12 months and must pay £75 compensation, £20 victim surcharge, after admitting assaulting a police constable in Cambourne Court, Shelley Road, Worthing, on October 22, 2017. Caroline Morris, 44, of Alderney Road, Ferring, was fined £200 and must pay £30 victim surcharge, £85 costs, after admitting drink-driving (112mg of alcohol in 100ml of breath) in Sea Road, Rustington, on May 12, 2017. She was disqualified from driving for 23 months. Jack Reeder, 26, of Rowlands Road, Worthing, must pay £300 compensation after admitting causing £300 damage to a door by destroying a glass pane at McColls, Heene Road, Worthing, on October 24, 2017. He also admitted breaching a conditional discharge order, no action taken. Zack Embleton, 21, of Taylors Close, Yapton, was fined £80 and must pay £50 compensation, £30 victim surcharge, £85 costs, after admitting assaulting a police constable in Yapton on October 29, 2017. Paul Dishot, 41, of Shadwells Road, Lancing, was fined £240 and must pay £365 compensation, £85 costs, after admitting causing £365 damage to a vehicle in St Andrew’s Road, Worthing, on August 6, 2017. Michael Whybrow, 53, of Wenban Road, Worthing, was given a community order with rehabilitation activity requirement and must pay £85 victim surcharge, £85 costs, after admitting breaching a sexual harm prevention order by displaying toys at his home so they were visible from a public place on September 15, 2017. Claire Heawood, 48, of St Cuthman’s Road, Steyning, was given a community order and must carry out 100 hours’ unpaid work after admitting failing to promptly notify Mid Sussex District Council of a change of circumstances affecting housing benefit, namely holding capital in excess of permitted savings, between June 16, 2014, and February 16, 2015; and failing to promptly notify the DWP of the same change of circumstances, affecting income support. She must pay £85 victim surcharge, £85 costs. Maria Withers, 33, of Hill Road, Littlehampton, was given a community order and must carry out 140 hours’ unpaid work after admitting stealing cash totalling approximately £600 from The Original Factory Shop, Rustington, between April 24, 2017, and May 9, 2017. She must pay £400 compensation. Kevin Waller, 58, of Middle Road, Shoreham, was fined £211 and must pay £30 victim surcharge, £85 costs, after admitting drink-driving (45mg of alcohol in 100ml of breath) in Middle Road, Shoreham, on October 31, 2017. He was disqualified from driving for 12 months. Troy Heaver, 20, of Canal Road, Yapton, was fined £50 and must pay £37.09 victim surcharge after admitting keeping an unlicensed vehicle on a public road in Canal Road, Yapton, on May 17, 2017. 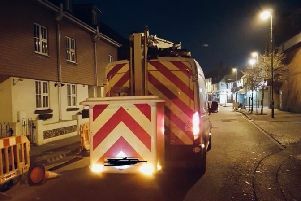 Russell Foord, 44, of Maybridge Square, Worthing, was given a community order and must carry out 50 hours’ unpaid work after admitting stealing a £247.18 generator from Future Management and Construction in Shoreham on June 12, 2017. He must pay £100 compensation, £85 victim surcharge, £85 costs. David Piner, 45, of Watling Court, Butts Road, Bognor Regis, was discharged conditionally for 12 months and must pay £20 victim surcharge, £85 costs, after admitting two charges of assault by beating in Southwick on October 20, 2017. Paul Bennett, 40, of Dinsdale Gardens, Rustington, was fined £275 and must pay £30 victim surcharge, £85 costs, after admitting breaching a non-molestation order by driving through Midhurst at 4.30pm on October 30, 2017. Lisa Callaghan, 48, of Radbone Close, Broadwater, was fined £250 and must pay £30 victim surcharge, £85 costs, after admitting drink-driving (41mg of alcohol in 100ml of breath) in Radbone Close, Broadwater, on November 5, 2017. She was disqualified from driving for 12 months. Jamie Danks, 28, of Vancouver Road, Durrington, was given a community order and must carry out 60 hours’ unpaid work after admitting drink-driving (85mg of alcohol in 100ml of breath) on the A284 Arundel on November 3, 2017. He must pay £85 victim surcharge, £85 costs, and was disqualified from driving for 20 months. Aiden Mant, 20, of Race Course Cottages, Arundel Road, Fontwell, was fined £120 and must pay £30 victim surcharge, £85 costs, after admitting drug-driving (6.3mg Delta-9-THC per litre of blood) in Barnham Road, Barnham, on September 29, 2017. He was disqualified from driving for 12 months. He was also fined £120 after admitting driving without insurance. He was fined £40 after admitting possessing cannabis in The Square, Barnham, on September 29, 2017. Umit Ozbey, 35, of St Botolph’s Road, Worthing, was fined £120 and must pay £30 victim surcharge, £85 costts, after admitting driving without insurance in Clifton Road, Worthing, on November 4, 2017. He was fined £80 after admitting driving without the correct licence. He was disqualified from driving for six months due to repeat offending. Ashley Taylor, 23, of Garden Crescent, Barnham, was fined £80 and must pay £150 compensation, £30 victim surcharge, £85 costs, after admitting damaging a vehicle in Barnham on October 3, 2017.